Do You Want A Western Kitchen? Do you have a hankerin’ for a western kitchen? Did you even know that was a possibility? 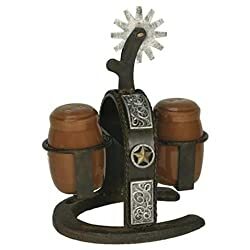 If you love western decor and cowboy decor then you can have a kitchen that is decorated with western and cowboy accessories. 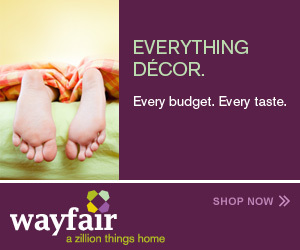 You can choose from things for your tabletop like dinnerware and salt and pepper shakers. There are options for organizing and storage needs with a western theme along with table linens and so many items that you just can not image. These items are awesome choices for a home that is decorated with a western theme, fun touches to incorporate in a rustic decor and even in some cases lodge decor. So, let’s look at our options for creating a western kitchen. One of the easiest ways to start a decorating scheme for a western kitchen is to have a set of dinnerware that you like. By picking the dishes first you can start to pick up colors to accessorize with. 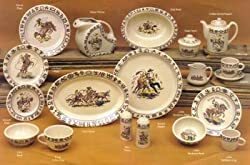 The border of all of the dishes have different types of cattle brands while the images on the dishes show different activities that a cowboy would do in a rodeo. 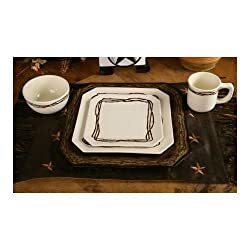 I am a huge fan of dishes that are square in their shape so I just love this set with a simple design of the barb wire that many western ranches would use to keep the cattle and horses within the boundaries of the property. 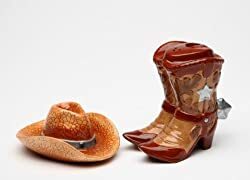 Add a whimsical touch to the table with a set of salt and pepper shakers with a western or cowboy theme to them. They can match the dishes that you picked or they can be something totally different. Here are a few examples of some fun shakers. This set is really cute and different, isn’t it? The spur sits on top of a horseshoe to form the base to hold the brown barrel shaped shakers. The boots will shake out the salt and the hat can add pepper to the food while the little set creates a fun and unique look for the family while they dine. 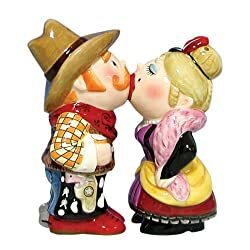 Oh that little devil dog of a cowboy is sneaking a kiss from the little gal from the local saloon! You can also add a western tablecloth if you like. There are several new ones that have a fun vintage style to them. 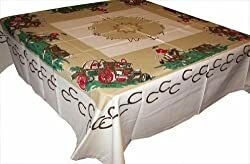 Such a nostalgic look to this 52 inch square cloth for your table! The border is cactus plants and there are cowboys riding horses, cowboy hats and gloves and wagon wheels to finish out the design. For a rectangle table this cloth measures 52 inches by 65 inches and has cattle brands in the center while the border shows ranch scenes. 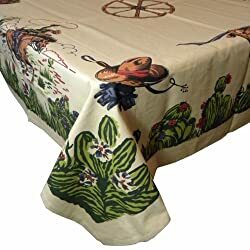 If a full tablecloth is not what you want to use a table runner with barbed wire would look really cool on any table with a western theme. Now, this square tablecloth is perfect in a kitchen, if you ask me! It has a chuck wagon theme which is where the cowboys out on the range would have eaten their vittles. It measures 52 inches by 52 inches. 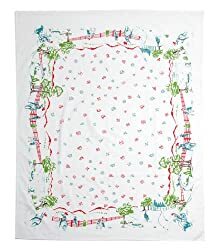 We always need towels in the kitchen so pick some that have cowboys, horses and other western themes. There are several options available. I’ll show you one of my favorites and you can go from there. The towels above have a very vintage style to them but there are also options available that are more contemporary in their design. 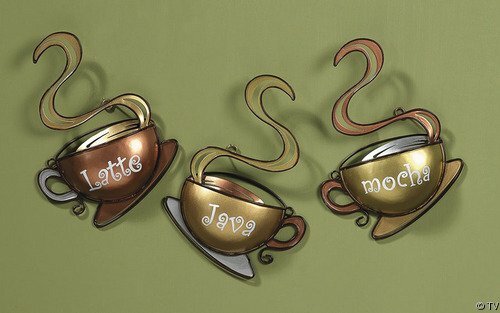 I just think the set above is cute and very different. As you can see with the options that I have showcased in this post, there is certainly a way to create a western style kitchen for your home. You can so traditional or fun and whimsical with vintage touches or maybe a combination of both. I recently had a friend ask me what I thought about red kitchens. Her question came about because she is wanting to change the look of her kitchen and she was hoping that I could give her some red kitchen ideas. Well, let me tell you as I told her, I love red in the kitchen! It is a color that is associated with love but it is also a color that stimulates the appetite. Have you ever noticed how many restaurants have a red decor? There is a psychology to that choice believe it or not. How Much Red Should Be Used? That is going to depend on several factors. You can go really bold and have your cabinets done in red if you have a budget that will cover that expense or if you are building a new home. My advice on that is make sure you really love the color because cabinets are an expensive change to make if you tire of the color in a few years. If you have painted cabinets, you could consider painting them red and that would be less expensive to change later. You could paint the walls red which is also easy to change later. That choice can be pretty bold and you should make sure that your cabinet color will tone down that boldness. White cabinets look awesome with red walls whether they are painted or tiled. Dark woods also look pretty cool, too. Just make sure that your red is in the same color family. If you wood has a orange hue to it using a red that has a blue tone to it will cause the two to fight each other and you will not like the result in your newly red kitchen. Most times it is best to choose a color scheme that has red as a complimentary color. Red and white, yellows and reds, or red, white and blue are combinations that are easy to find things to decorate with. There are red appliances and red accessories that will give you a delightful and cheerful red kitchen. My friend has cabinets that are similar to my own which are a rich warm walnut color. She is not planning on changing the cabinets and I don’t blame her one bit because I love the look of the dark woods. The picture on the left is from my own kitchen but hers look almost the same except for the door pulls. With the color of her cabinets I have an idea for how she should go with adding red to her kitchen. Even though we both have rather large kitchens the darker wood makes everything appear on the dark side so to help balance that out we need to either go with all dark colors or use lighter colors to add some interest. I am suggesting that she go with a little red instead of a lot of red. I have suggested that she consider a yellow and red color scheme for her new look in her kitchen. This is a color combination that was very popular back in the 1940s and it can be so much fun to work with. Since we both love vintage things we can have some fun finding some accessory pieces to add some interest, too. With the dark cabinets that she has to work with, I think that a soft buttery yellow paint will work on the walls. We will add red with small appliances in a nice rich red color. 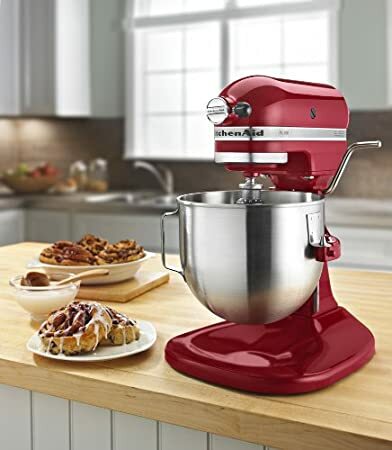 She needs a new mixer so I showed her the one shown below and she loves that color of red and the mixer, too. Maybe a red canister set, some red towels and some red utensils and that may be all of the red that she uses. Just enough to make a nice statement without getting too powerful with the reds. She can then find a vintage tablecloth that has yellow and red in the pattern to put on the kitchen table. That will be the fun part, going to local flea markets, antique shops and auctions looking for little treasures to add to her new look. She could go with a red refrigerator and stove but she feels that she should not go to that expense right now and I understand that. Besides that could be very limiting in a few years if she wants to change colors again. She would be stuck with the red until the large appliances need to be replaced. 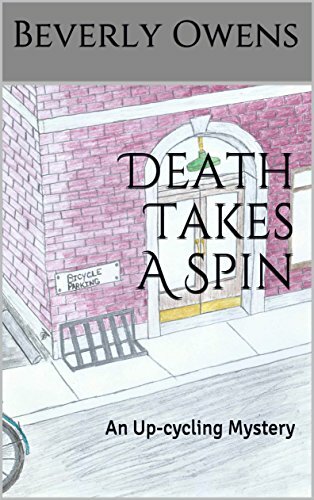 I know I mentioned this a little bit above but it is worth mentioning again. If you are going to use red, either a lot or a little, make sure that your reds blend well together and with the other colors in your room. 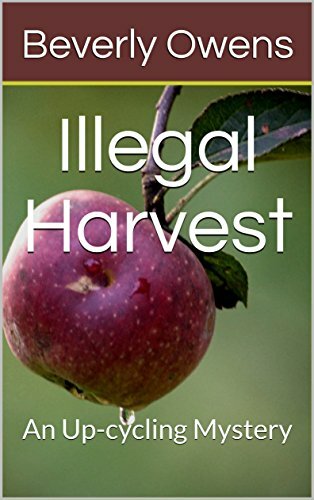 The red of a ripe strawberry has a bit of a blue tone to it while the red of a ripe tomato is going to look more orange. Does that make sense? Both are red but belong to a slightly different place on the color wheel. One will look better with colors that have a blueish hue to them while the other is going to do better with oranges, bright yellows and sunnier colors. If you think you might like to add some red to your kitchen decor you might like looking at these red kitchen accessories for some ideas on how you can do that. Red is a vibrant and powerful color and can really add some pizzazz to your kitchen.